← We said before: Bolivia in the verge of becoming Somalia/Afghanistan, thanks to the egomaniac coca grower caudillo mismanagement! 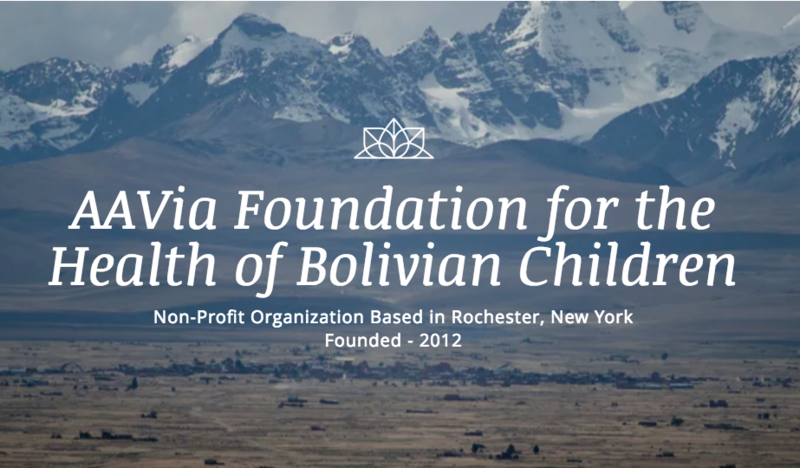 Members of the Rochester community celebrated their own contribution toward children’s health in Bolivia at the fourth Annual Gala for the AAVia Foundation for the Health of Bolivian Children on Oct. 13. Every AAVia Foundation gala features a special guest visiting from Bolivia. Guests were treated to a performance of traditional music by Boris Vasquez, a conductor and musician who leads the Youth Symphonic Orchestra of Santa Cruz in Bolivia. He was joined by local musician Freddy Colon and a jazz trio, who performed with Vasquez as he played a quena, a traditional Bolivian reed flute. Ginny Ryan, of 13WHAM news, was the event master of ceremonies for the second year in a row and brought her experience as a community icon to this local nonprofit event. The evening finished with a performance of “Love From the Time of Cholera,” an article recently written by Timothy Malia, medical director of the AAVia Foundation. He was joined by Annette Ramos as they performed the piece, which told of Malia’s experiences during the 1992 cholera epidemic in Bolivia. Proceeds from the gala and the accompanying silent auction fund health programs for children in Bolivia through the AAVia Foundation’s partnerships. In 2017, their partnerships included the Clean Hands, Healthy Schools program, which teaches rural schoolchildren about hand and dental hygiene, and a scholarship program for nursing students at the School of Nursing at Pucarani, Bolivia. Donations to the AAVia Foundation are tax-deductible and impact the lives of Bolivian children and their families. Contributions can be made at AAViaFoundation.org; or by mail to P.O. Box 237, Fairport, NY 14450. Bolivian Thoughts opinion: I can only say thank you to the American people who give their funding and time for Bolivian Children through great institutions like AAVia Foundation! This entry was posted in Bolivia, Health, La Paz, Santa Cruz and tagged AAVia Foundation. Bookmark the permalink.